Ok, I’m going to say it, school fundraising isn’t a ton of fun and figuring how how to create a successful school fundraiser can be hard. But, it is necessary for your school to thrive. Sometimes an idea is successful, other times you wonder why you even tried. After helping with more campaigns than I can count, I’ve noticed there are two types. The ones where you resell an item through a fundraising company and collect a small percentage. Or, the ones that you come up with on your own. There are advantages and downsides to both. Going with a company allows them to take most of the burden. They provide the advertisement, how to order, and supplies. The problem is that you get very little in the end and lets be real, does grandma really need another bag, wrapping paper, or a bucket of cookie dough? I know my mother-in-law still has 2 in her freezer from a few years ago. Coming up with your own fundraiser can generate a lot more money, but you are faced with more volunteer hours, fronting the cost of any supplies, and figuring out how to get the word out. 6 TIPS to help you create a successful school fundraiser. 1. Have a kick off party. If this is the biggest campaign of the year, then ask your principal if one afternoon you can host a pep rally. This does a few things. It gets the kids involved, explains why you are fundraising, and allows for you to teach the kids how to raise the money in a safe and polite way. This is what fundraising companies have perfected. But there’s no reason for you not to be able to do it as well as them for a little amount. You don’t need 15 prizes like they have, just one. I’ve used InkHead to help me create custom prizes that cost less than $1 a kid. It’s amazing how such a small thing will really get the kids motivated. Send home flyers in the weekly folder. Have it put in your PTA newsletter. Have every teacher include it in the weekly emails and ask homeroom parents to email our reminders. Add pictures of kids earning prizes on your school’s social media account daily. Make multiple signs to line the carpool line near the end of the campaign to remind parent. Have some kids dress up in the morning and promote during morning drop off. Many of these ideas I also do BEFORE the fundraiser, as well as during, to the make the parents and kids aware that something will be coming up. People are always more willing to give if you can give a clear goal. Saying, “Oh, it’s for my school,” isn’t enough. Be specific. Does this money help pay for school supplies, replace an aging sound system, give teacher some much needed supplies? Tell them that. The old school way of collecting cash and checks can still be done. But I can’t tell you how many times parents have said to me, “Oh yeah, I totally forgot about it because it just got lost in my pile of stuff.” Create a way for them to easily hop online and take care of it. Chances are they are already online so why not bring the sale to them? Using PopUp Funds makes this super easy. Enter in all of the items you want to sell, attach the PopUp to an account, then send out the link on social media and flyers. All orders are tracked for you. No stacks of paper order forms or lost checks. It will save you hours of time. This one won’t be done for a while. But make sure that you show off how the money is spent. If it’s an item, take a picture of the students using it and post it on social media. Was it an event? Do the same thing. Also, make sure to thank people after the fact. Mention how much that item was appreciated and how it enhanced the school the next time you see them. Some of these tips are small but it’s amazing what they can do to make your fundraiser successful. Good luck and don’t forget that you can create your own PopUps for more than just fundraisers. And checkout how to use PopUp Funds to help with sports teams. 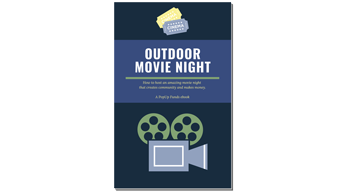 Download our FREE booklet “OUTDOOR MOVIE NIGHT How to host an amazing movie night that creates community and makes money” and sign up for our free eNewsletter. PopUp Funds made my life easy when I hosted a crafting party...PopUp Funds website was very professional, and the dashboard was very easy to navigate. I also loved that I could easily share the event through social media! Copyright © PopUp Funds 2019. All rights reserved.